Show your home movies! or come just to watch. 16mm, 8mm, Super 8 film, Video 8, Hi-8, Digital 8. 2 Daly Ave., Ottawa, 613-569-1789. Saturday, October 18, 3pm-5pm, free! 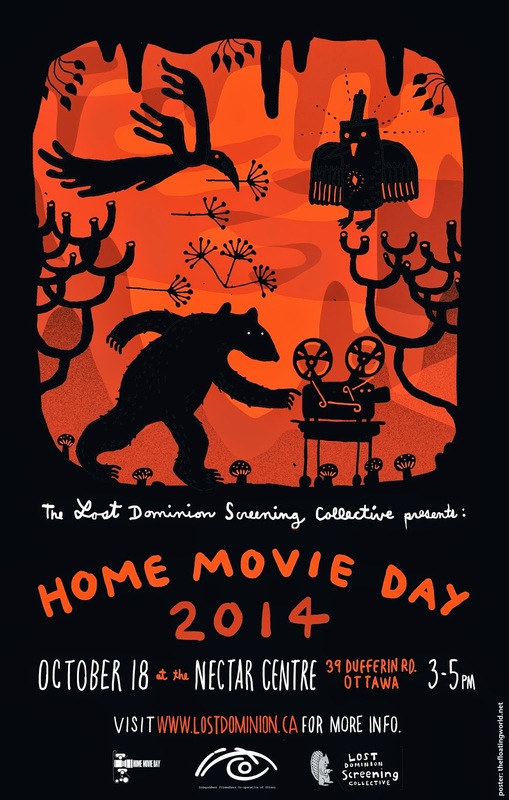 The Lost Dominion Screening Collective and IFCO are happy to announce that Ottawa will participate in this year’s International Home Movie Day on Saturday October 18, 2014 at the NECTAR centre on 39 Dufferin Rd. from 3-5pm. Home Movie Day is an annual event celebrating amateur film and filmmaking. The audience is invited to bring their own “home movies,” which will be shown on the big screen. The event provides an opportunity for attendees not only to view their own home movies in their original format (since many people don’t own their own projectors anymore), but also to learn more about our community and cultural narratives through the personal histories revealed within these shared films. Films can be dropped off at IFCO in advance of the screening so they can be inspected and selected. IFCO will take the films up till Oct. 15th. You may also just bring the films on the event day but we cannot guarantee that they will all be played. Trained archivists will be in attendance to answer questions, and prepare material for screening. Home Movie Day was started in 2002 by a group of film archivists concerned about what would happen to all the home movies shot on film during the 20th century. They knew many people have boxes full of family memories that they’ve never seen for lack of a projector, or out of fear that the films were too fragile to be viewed. They also knew that many people were having their amateur films transferred to videotape or DVD, with the mistaken idea that their new digital copies would last forever and the “obsolete” films could be discarded. Original films (and the equipment required to view them) can long outlast any version on VHS tape, DVDs, or other digital media. Not only that, but contrary to the stereotype of the faded, scratched, and shaky home movie image, the original films are often carefully shot in beautiful, vibrant colour—which may not be captured in a lower-resolution video transfer. Home Movie Day has grown into a worldwide celebration of these amateur films, during which people in cities and towns all over meet their local film archivists, find out about the archival advantages of film over video and digital media, and—most importantly—get to watch those old family films! Because they are local events, Home Movie Day screenings can focus on family and community histories in a meaningful way. They also present education and outreach opportunities for local archivists, who can share information about the proper storage and care of personal films, and how to plan for their future.